The Ultimate Computer Chassis with yet more options. The U2-UFO Opti-1203 meets the demand for users with more 5.25 devices and or less system fans. This case holds up to a whopping 10 - 5.25 devices and maintains superb airflow and adequate space for mods or water cooling. 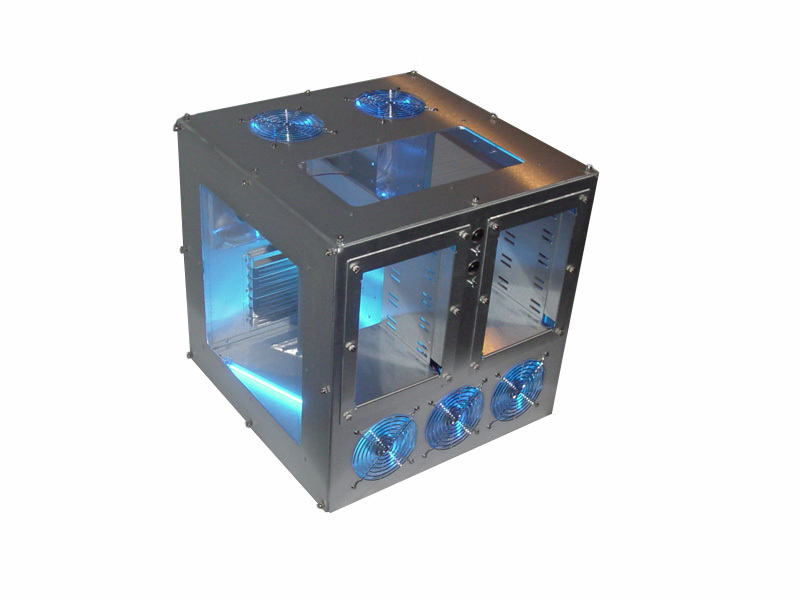 Triple 120mm intake fans align with the Thermochill HE 1203 radiator. Two Power Supply ports allow for use of dual or redundant power supplies for the heaviest of loads. An acrylic plate covers the optional port. The U2-UFO is fabricated by skilled workers in the USA. It is made from thick aluminum making it lightweight, sturdy, and thermally friendly. Casters are included for easy mobility.